In heraldry, the term arms is used to describe the arrangement of symbols on a shield of arms which is the central element of a coat of arms or heraldic achievement. The rules of heraldry (or law of arms) relating to clerics and ecclesiastical juridic persons are different in many respects from the rules relating to laymen and civil law bodies. Shields of arms, both ecclesiastical and lay, are usually surrounded by external ornaments which identify the rank of the person and, sometimes, the nature of the institution whose arms they are. These external ornaments may change from time to time and are not an integral part of the arms although they are included in the term heraldic achievement. For an Archdiocese, the external ornaments often, but not universally, used are a mitre preciosa with infulae on top of the shield and a crosier in saltire or a double transverse cross behind the shield. The use of these external ornaments is optional and inessential and is a matter of personal choice for each ordinary. 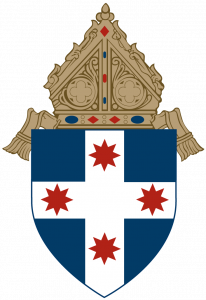 The arms of the Archdiocese of Sydney are displayed with the mitre preciosa but neither the crosier nor the cross is used. The full achievement consists of a mitre preciosa surmounting a shield of the arms of the Archdiocese. The arms of the Archdiocese date from 1883 and clearly derive from the badge of the colony of New South Wales which was assigned to the Colony of New South Wales in 1876.
the red cross on a white field derives from the Cross of Saint George which is the flag of England. three gold stars of eight points represent the constellation of the Southern Cross. The Colonial badge was immediately adopted into the Colonial (now State) flag and later formed the basis of the State arms of New South Wales which were granted and assigned in 1906. It appears that the arms of the Archdiocese were designed by of for Archbishop Roger Vaughan but not adopted before his unexpected death on 17 August 1883. Archbishop Patrick Moran appears to have assumed the see arms on his arrival in 1884 by way of completion of Vaughan’s unimplemented plan. the stars of the Southern Cross constellation reinforce this crucifixion imagery, and also refer to the location of the Archdiocese. the colour blue in the field of the arms of the Archdiocese traditionally represents the Virgin. The Australian Church has had a special devotion to the Virgin Mary since its foundation. The present Cathedral is the successor to St Mary’s Chapel built on the site in 1821 and Mary, Mother of God was named as the Patron of Australia in 1 January 1901.